Heavy metals are a component of many traditional medications. The ill effects of chronic ingestion of heavy metals are protean. However, they continue to be used for trivial causes. Chronic heavy metal exposure is an important but under-recognized cause of renal damage. The diagnosis is usually made by the finding of unexplained renal dysfunction and the history of exposure to a drug containing the heavy metal. A 2-year-old girl presented with anuria of 4 days duration. The anuria was preceded by intermittent vomiting for 2 days. She had no preceding fever, diarrhea, skin rash, or red urine. Her physical growth and motor milestones were normal. She was not yet speaking a single word, did not interact with other children, and avoided eye contact. On enquiry, there was a history of intake of medications from a traditional healer for the past 5 months, which according to parents were given to promote normal growth. Physical examination was unremarkable except for a blood pressure of 130/80 mmHg. Her investigations revealed blood urea nitrogen 71 mg/dL, serum creatinine 11 mg/dL, estimated glomerular filtration rate (eGFR) 4.7 mL/min, Na 127 mEq/L, K 5.7 meq/L, hemoglobin 11.1 g/dL, platelet count 3.7 × 10 3 /μL, total leucocyte count 13,900 × 10 3 /μL, and serum lactate dehydrogenase 2000 U/L. Peripheral smear revealed no schistocytes or malarial parasites. Her C3 levels were normal and the antinuclear antibody, anti neutrophilic cytoplasmic antibody and anti-glomerular basement membrane antibodies were negative. Serology was negative for IgM antibodies to leptospira. Ultrasound of the kidneys revealed enlarged kidneys. 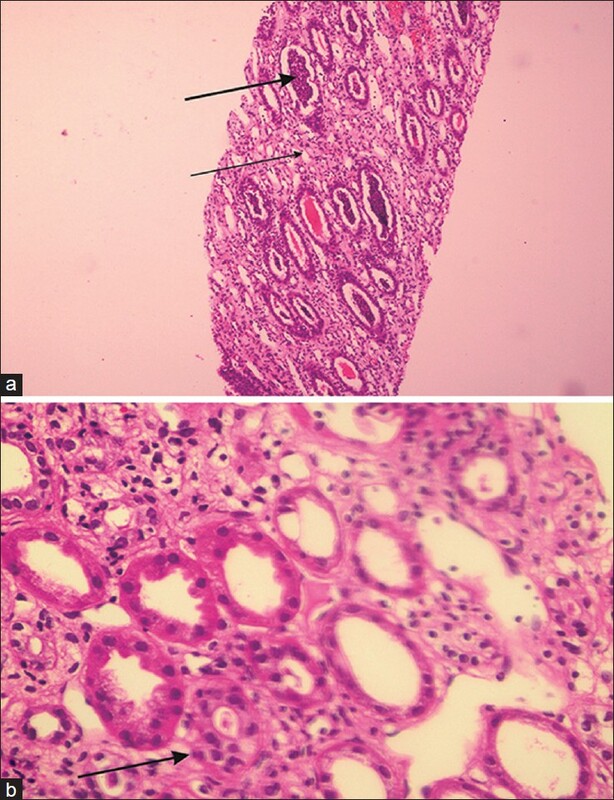 Renal biopsy [Figure 1] revealed normal-looking glomeruli, tubules showed moderate neutrophilic infiltration, dilation, and cellular casts comprising neutrophils and tubular epithelial cells. There was no evidence of crystals, viral inclusions, or rupture of tubular basement membrane. Interstitium revealed edema along with mixed infiltration with neutrophils, lymphocytes, and occasional eosinophils, without any evidence of granulomas or fungal elements. Histopathology was suggestive of acute tubulointerstitial nephritis. She was started on peritoneal dialysis and given three intravenous pulses of dexamethasone on alternate days. Subsequently she was put on oral prednisolone at 2 mg/kg/day and was shifted to hemodialysis. She remained dialysis dependent for a total period of 17 days. During this period, she had multiple episodes of convulsions with altered sensorium due to severe hypertension, which required four antihypertensive agents for control. Neuroimaging and electroencephalograph were normal. She developed hemodialysis catheter-related Acinetobacter sepsis, requiring catheter removal and antibiotic therapy. There was a drop in hemoglobin, requiring one packed red blood cell transfusion. The urine output improved after 2 weeks to 1 liter/day over a period of 4 weeks. There was a progressive decrease in creatinine levels to 1 mg/dL (eGFR - 51.7 mL/min) at the time of discharge. The ayurvedic medications were retrieved and sent for heavy metal toxicological screen. The analysis reported 2066.6 ppm of mercury, which amounted to a daily intake of 289.324 micrograms of mercury as against an average daily human intake 2.31 microgram. Lead and arsenic were undetectable. Chelation with D-penicillamine was started and continued for 6 months. Mycophenolate mofetil was added and oral steroids were continued in gradually tapering doses for 6 months. On follow-up, the urine mercury levels were within normal levels. She is now normotensive without medications, has normal creatinine levels (0.7 mg/dL), eGFR-73.8 mL/min, and no proteinuria. On 6-month follow-up, she had begun talking, was friendly, and had started attending play school. Our patient presented with anuric renal failure without any preceding illness and showed no evidence of infection, autoantibodies, or microangiopathy on investigation. Renal biopsy revealed acute tubulointerstitial nephritis. The history of chronic drug ingestion and the finding of high levels of mercury in the medications increased the likelihood of nephrotoxicity due to mercury ingestion. Most cases of mercury intoxication have resulted from the consumption of contaminated fish or dental amalgams. Heavy metal exposure due to consumption of ayurvedic medications that are rich in heavy metals is not uncommon and can cause serious renal damage. Mercury is primarily excreted by the kidneys. This, coupled with the high relative vascularity and concentration ability of the kidneys, makes them the prime target of mercury toxicity. Mercurial salts cause mitochondrial oxidative damage by linking to the sulphur-containing molecules, thereby depleting the glutathione stores and resulting in tubular necrosis. Proximal renal tubules are preferentially affected. Mercury is also known to cause tubulointerstitial nephritis and immune-mediated glomerular damage. Renal involvement can present as renal failure, hypertensive encephalopathy, nephrotic syndrome, chronic tubulointerstitial nephritis, or with isolated tubular dysfunction. ,,,, Severe hypertension and hypertensive encephalopathy have been reported with mercury poisoning in children as was observed in our patient who had repeated episodes of seizures due to hypertension despite good volume control. , The organs involved and the type and extent of damage produced depend on the chemical form, length, and degree of mercury exposure. Public awareness regarding the risks and caution in the indiscriminate intake of untested medications is needed to avoid preventable organ damage. 1. Dargan PI, Gawarammana IB, Archer JR, House IM, Shaw D, Wood DM. Heavy metal poisoning from ayurvedic traditional medicines: An emerging problem? Int J Environ Health 2008;2:463-74. 2. Neustadt J, Pieczenik S. Heavy-metal toxicity-with emphasis on mercury. Integr Med 2007;6:26-32. 3. Kazantzis G. Mercury exposure and early effects: An overview. Med Lav 2002;93:139-47. 4. Sharifian M, Noorisafa M, Kiahosseni M. Hypertensive encephalopathy induced by mercury poisoning; a report of 3 cases (in an Iranian family). Iran J Child Neurology 2007;1:53-9. 5. Kazantzis G. Mercury and the kidney. Occup Med 1970;20:54-9. 6. Torres AD, Rai AN, Hardiek ML. Mercury intoxication and arterial hypertension: Report of two patients and review of the literature. Pediatrics 2000;105:E34. 7. Kaizu K, Uriu K. Tubulointerstitial injuries in heavy metal intoxications. Nihon Rinsho 1995;53:2052-6. 8. Verma S, Kumar R, Khadwal A, Singhi S. Accidental inorganic mercury chloride poisoning in a 2-year old child. Indian J Pediatr 2010;77:1153-5. Suneeva Sharon Christa, A., Rathinam, P., Rajesh, N.G., Viswanathan, P.